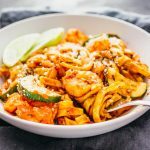 This Cajun shrimp pasta has linguine noodles tossed with shrimp, zucchini, and onions in a spicy red sauce. Cook pasta according to package instructions. Drain and rinse with cold water. Set aside. Heat olive oil in a pan over medium-high heat. Add shrimp and cook until no longer transparent. Transfer to a plate and set aside. Add sliced zucchini and diced onion to the pan, cooking until tender, about 5 minutes, stirring frequently. Add minced garlic, tomato sauce, and all dry seasonings to the pan. Stir well. Bring to a simmer. Add reserved linguine pasta and cooked shrimp to the pan, and stir until well-mixed. Serve garnished with finely grated parmesan cheese.